In grad school I began experimenting with poetry form with new purpose, hoping to discover ways to interpret hybrid versions to make my own. I know, I'm a late bloomer. Last one to the party. What poet doesn’t do this, right? Doesn’t drink this kool-aid, then spike it with her own brew until it’s a new version of the original drink? I know. But this is where I’ve discovered some of my best verse and where I’ve witnessed others do the same, so it’s a discussion worth joining. Before delving into dialogue on poetic form, I’d like to highlight what even draws me to writing and reading poetry. It’s not that it’s cute or catchy—as many of my friends and family imagine it as while they scratch their heads, wondering why I work so hard to blend it into my career. The type of poetry that sustains the test of time and respect in the literary world is the opposite of cute or catchy. In the words of Dorianne Laux, “Poetry is a difficult church.” “The poem,” then, according to Edward Hirsch, “is a soul in action through words.” Those of us daring enough to put in the hard work of poetry know it’s tough to write and often tougher to read (in the sense of facing content, not struggling to grasp it). What I find most inspiring about poetry are the ways it “tries to get at something elemental by coming out of a silence and returning us—restoring us—to that silence” (Edward Hirsch, How to Read a Poem and Fall in Love with Poetry). Poetry becomes a vehicle for exploring and examining our soul—the good nature conflicting with the bad, the generous with the greedy, the beautiful with the horrific, the carnal with the spiritual. There never seems to be a formula or method for reconciling the characteristics that comprise each side of the spectrum, just an endless cycle where one side of the soul is in friction with the other. Poetry that penetrates our soul space gets us to return to that quiet place of solitude. It keeps us wanting to solve the mysteries of our own polarity. Poetry is often the only invitation we receive to do such reflection—the type of reflection we need to exercise not only to understand ourselves but also to realize what drives the world we cohabit. All this said: it’s often challenging to begin writing a poem with our thoughts alone. For me, form offers me a container so-to-speak to hold my thoughts as I mold them line by intentional line into a potent poem. Yes, I imagine you shaking your head and thinking that’s a formula for writing the very poems new writers often develop, which tend to sound cute and catchy no matter how dire the topic. You know the ones. Those poems that mimic archaic syntax, strict line end rhyme schemes, formal line lengths and metrical patterns and just scratch the surface of what the poet is getting at. These techniques are important to learn. Yet, great poets learn, learn to use, and then learn to break the rules. And they learn by studying current poets along with the classics. The form and formal conventions that worked for one poet may not be the exact formula that will work for another. If a poet tries to incorporate all or most of the conventions at once, she risks never uncovering the essence or soul of a poem. This being because what drives this type of exercise is conforming and forcing your ideas to fit a set form and formal conventions without alteration rather than discovering what drives the impetus of having to even write a particular piece. Of all the extraordinary strategies I learned in grad school, the most life changing one for me was the practice of peeling away the surface matter in a poem to get at the essence of the piece and, in doing so, be a fellow traveler in the discovery process. Playing with form and its associated conventions has helped me get at the essence without restricting myself to another person’s thought and speech patterns. My ideas of form experimentation were challenged immediately in my first grad school term with the time I spent dissecting Terrance Hayes’s and Martha Collins’s adaptations of sonnets. Beyond the conventions of the sonnet—14 metered lines, tight motif, the octave/sestet or couplet turning point—I was discovering what the form offered for melding one’s private and public sociopolitical realms. I like what Strand and Boland say about the sonnet in The Making of a Poem as they discuss the history of the form and why poets are still drawn to its conventions. They state the sonnet provides a poet with “a form that is short, easily comprehended and its historic structure still opens the way for living debate and subtle argument.” As a form, it has a capacity to create “imagistic compression of argument” and “tension between lyric and narrative . . . [suggesting] narrative progress through its sequence structure, while, in single units, it is capable of the essential lyric qualities of being musical, brief, and memorable.” A narrative poet striving to bring literary merit to my poetry, I set out to explore these sonnet conventions and experienced immediate breakthroughs in my work. But my time with sonnets was only a breakthrough that lead me elsewhere. Enter prose poetry. While this is a form that subscribes to many schools of thought, its reliance on poetic conventions is what keeps it grounded to the genre. Often narrative with paragraphs in place of stanzas, a focus on language, imagery, meter/rhythm, and emotional climate replace character and plot development. What I was after in playing with prose poem form was relying on compression of line, fragmentation, and sound as I wrestled with weaving the private and public while building tension between the lyric and narrative—a practice I picked up during my time with the sonnet. I was also after preserving the integrity of the individual line, which invited interesting discussions in our workshops. During one of them, our mentor, Iain Halley Pollock, pointed out that I may be wasting my efforts at the line level since publishers typically print pages with text that spans four-and-a-half inches. I brought this idea back with me after residency and tried to forget about the line. And my prose poems began to suffer. What these poems lacked was everything I had grown to love about what the line represents and offers the poet and poem. More specifically, these poems lacked soul. In ditching a focus on the line itself, I began to lose compression, duality, and fragmentation—devices I rely on for tension and underlying meanings. 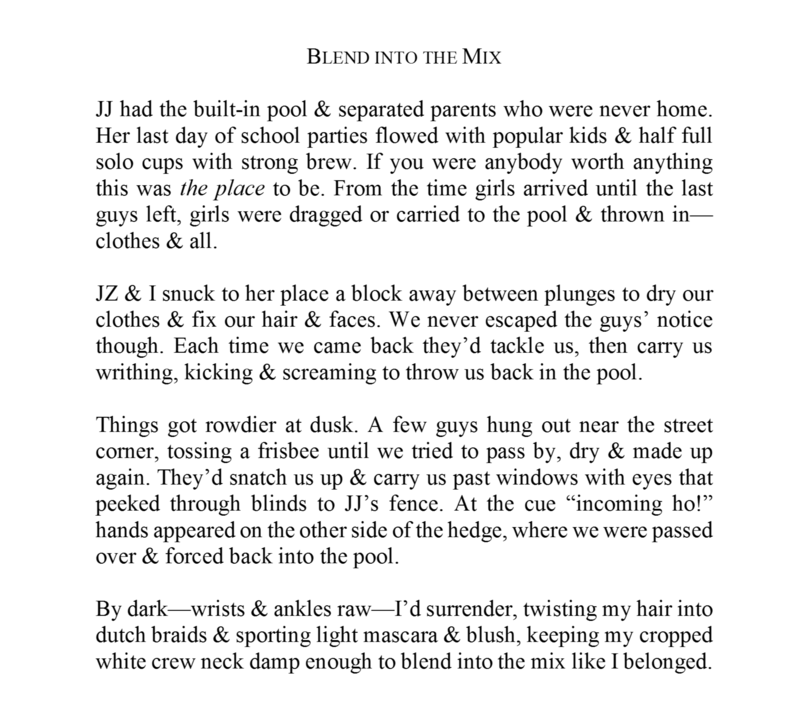 My prose poems felt more like (underdeveloped) lyrical prose than poetry. And for me, when I had just hit my stride with line craftsmanship, I found myself at a roadblock with the bridge out ahead. So, I took these pieces and began to lineate them only to enhance certain parts while the others didn’t benefit. No good. Then, I thought, what if I view them on the page as an editor would during a publication run? When I changed the margins and narrowed my page width to four-and-a-half inches, intentional lines came into focus. With my new white space restrictions, the lines that spanned the page regained potential for compression, duality, and fragmentation, which helped during initial development and revision, where I often tap into the second essence of a piece. I know this technique is not my invention but, without a term for it that I’m aware of, I only discovered it by coming back at my craft again and again until this struck me. As I play with my version of a prose poem, I continue to discover details and what informed my ideas or experiences. When a new prose poem idea hits me, I strike the page with a purpose that is thrilling to write through. And I get where I hope to go faster. I feel, often, the atmosphere shift as I find the soul in what I’m trying to share in the first draft. I leave you with my newest prose poem, which is a piece that fits into my memoir in verse, Blood Sisters. While it’s currently a fresh piece, it’s realized and demonstrates the strategies I discussed here. I know I’ll revise as I discover new details. Heck, I wrestled with it as I pasted it here to share and found two more places to tighten the line and, in doing so, enhanced the tension and sound in the piece. Writers employ imagery in their work so their written worlds become vivid in readers' minds. A well-crafted image enriches a text as it helps readers visualize an otherwise abstract space. Regardless of the written medium—poetry or prose, academic or trending—how an author invites readers into the visual space the text inhabits will influence its lasting effects. Consider all the texts you find most memorable. Were there visual elements or interesting juxtapositions that still stand out in your memory? Chances are you just nodded your head. While writers write for many reasons, writers share their writing to inspire reactions from readers. These many reactions include connection, empathy, insight, curiosity, exposure, outrage, support, enjoyment, conversation, celebration, activism, and so forth. This said: when we as writers develop work to share with audiences, we infuse it with illustrations and examples designed to aid readers in better envisioning and understanding our presented ideas. Writing memorable imagery is a science or sorts. The science in writing imagery is as intricate as it is disparate, which leaves many ways it can be approached. Such vastness also means there will be many reactions to one unchanging image. Imagine a landscape with several footpaths that all lead to the same destination and you can begin to appreciate where I hope to take you. Since each path enters the target point from a different place, each perspective view will differ. Every traveler sees from his unique vantage point and may even notice things others do not—whether in his sight line or not. The same is true for each reader’s experience with a text. How readers experience the course and ultimate entrance to the text’s landscape may differ due to vantages, perceptions, biases, views, and values. So how do writers get an audience of diverse readers on the same page? Is the point even to deliver one universal reaction? Or is the point to evoke an experience in readers’ imaginations that they will make what they will of it? Like any worthy exploration, let’s dissect a tried and tested way I have approached imagery with wonderful results. From birth, the average child is read to or told stories on a regular basis. We are conditioned from this early age to imagine landscapes and worlds along with their contents and value systems. Whether grounded in realism or symbolism, the details in these stories are usually vivid and often metaphorically encoded, likening one thing to another in interesting ways. We learn to write and express ourselves on the page by mirroring these childhood storytelling strategies. Then, somewhere in our educational years, many of us are taught to put away our childish thinking and write using our words—not our images and illustrations. This being my own experience and that of many of my college students got me thinking. Aren’t the most memorable texts those that master using words with images and illustrated examples as backup? I never noticed the hermit crabs before. / They spend entire days assessing vacant shells / & assigning the gathered crabs their new homes. / Whoever said size doesn’t matter hasn’t factored // in the rewards of shell surfing. Abandoned shells / become growth charts—memorials that measure // one’s loss as another’s gain. [The dynamics / of vacancy chains in motion]. I wake one morning as one does in a dream. / The cloudscape’s distorted,its dialect unfamiliar. / It’s clear I’ve entered a foreign landscape. Neither [person] notices me in my circumscribed shell. While my hermit crab tendencies started as a simple act of hiding in my shell—the queen cliché—my exploration led me to a renewed way to express the idea and a more meaningful conclusion. The beauty here is that I could not have arrived at these details without researching the science. I couldn’t even get beyond the abstract idea without exploring what it meant to inhabit the hermit crab’s identity. And that’s the magic for us writers during the writing process: finding our way through the abstract in order to discover the concrete. Readers sense these developments and it’s what keeps them there with us throughout the text. Whether readers can or cannot relate to a writer’s ideas or images is not the point. Making said ideas or images tangible is key. Finding a balance between explaining, demonstrating, and illustrating is a worthwhile challenge. What science can you bring to your writing that will make it more vivid, more interactive, and more memorable? Pick an idea, concept, or physical item and research it. What do you discover that you can bring to your text? What do you discover about your current text or yourself or our shared world while spending time with the science? How have you incorporated these findings into your work? If you care to share your discoveries or own tricks, comment below. I look forward to experiencing the magic crafted into your images.